We take California finely minced sundried tomatoes, combine them with harissa paste, and dissolve the blend in our finest California extra virgin olive oil. 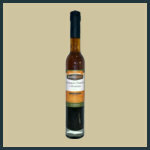 A touch of our balsamic vinegar from Modena and shallots are added creating a vivid sweet and slightly spicy condiment. If you are not familiar with harissa, it is a spicy and aromatic chili paste that's a widely-used staple in North African and Middle Eastern cooking. Harissa varies between countries and regions, but typically it is a blend of hot chili peppers (which are often smoked), garlic, olive oil and spices, like cumin, coriander and paprika. Oh, and by the way? Harissa and tomatoes are magical together! Our flavor-packed Sundried Tomato with Harissa oil can be used as an enhancement for many foods. 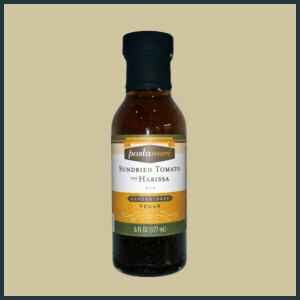 Use it as a marinade for meat and fish. Blend it into hummus, or any of your favorite dips. Use it to liven up your pizza. Try it on pasta, or in vegetable salads. Most of all? We love it alongside a crusty baguette... it's bread dipping heaven. We mince sundried tomatoes, combine with harissa paste, and dissolve the blend in our finest CA olive oil. A touch of balsamic vinegar & shallots are added creating a vivid sweet & spicy oil. This is flavor-packed richness from the Mediterranean! Please take a moment and 'Like' our Nan's Gourmet Foods Facebook page! You will find us quite active on Facebook, from recipes, to 'where we will be' this weekend, to Wine Wednesday! Check it out! You may enter your email here if you would like to receive our newsletter. An email will arrive about four times per year - with news, recipes, new products, sale items & more!